This tutorial is about how to configure your Unity to get transparent top-panel and window title bar. I did following in Ubuntu 11.10 Oneiric with Unity desktop. 1.) Get the transparent top-panel. Then launch CCSM. Click to go into Unity Plugin’s configuration page, in Experimental tab change the value of Panel Opacity. 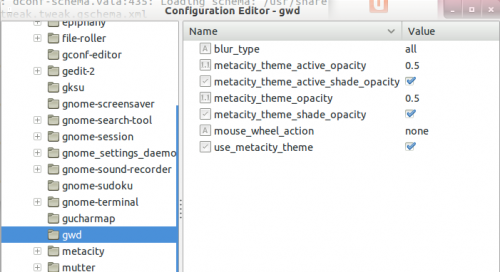 Press Alt+F2 key combination and run gconf-editor, then navigate to apps/gwd. In right, change the value of “metacity_theme_active_opacity” and “metacity_theme_opacity” range from 0 to 1. 4 users responded in " Ubuntu Unity Enable Transparent Panel and Window’s Title Bar "
and set value to 85.